It’s “Movember” in NOLA and the Mustachio Bros are ready to help. 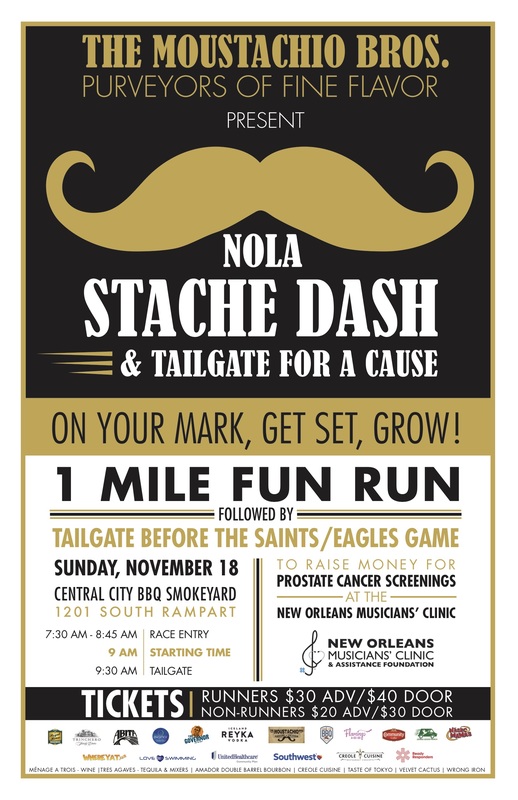 The annual NOLA Stache Dash is a 1-mile competitive run and fun run held in conjunction with Tailgate for a Cause, to raise money and awareness for prostate cancer at the nation’s only Musicians’ Clinic. But you don’t have to walk or run in order to enjoy the event! The Tailgate for a Cause is also a party with plenty of Abita Beer, Bloody Marys, great food, live music and a moustache contest. Proceeds from donations, sponsorships, raffles, auctions and tailgate passes benefit patients of the New Orleans Musicians’ Clinic. Every $100 raised will provide one prostate cancer screening for a local musician – regardless of that musician’s insurance status. So stop shaving now, grow your stache, and get in shape for the most fun run of the year! Medals will be awarded to the top three male and female finishers in each category, plus prizes for the Best Moustache and Beard. Sponsorship Opportunities available now! Download more info here (PDF). One lucky person will win a trip for two! Tickets for our year end raffle are on sale and available to all now. A $20 ticket enters you to win a once in a lifetime trip to San Francisco and California wine country! 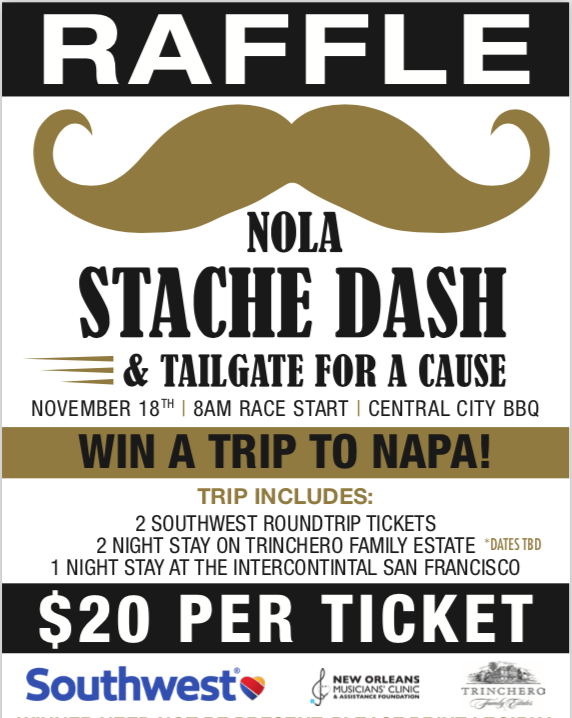 All Stache Dash registrants are automatically entered. Additional tickets can be purchased for $20. Winner need not be present at drawing to win. Sponsored by Southwest Airlines, Trinchero Family Estate and the Intercontinental San Francisco. Raffle proceeds benefit the NOMC. Call (504) 415-3514 or email Betina at betina@nomaf.org to enter now!